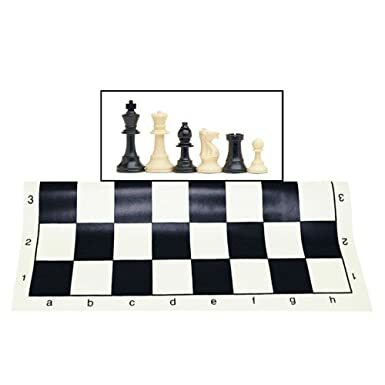 There is not a great deal of variety in the offering of “standard tournament chess sets.” However, I did find a few key distinctions after digesting multiple reviews and reading the comments of those who already purchased these products. That’s because tournament regulations clearly define a standard set that contains white and black pieces with a “Staunton design,” a board with 2 ¼” squares, and a king with a height between 3 ¾” and 4 ¼” high. Now let’s look at the implication of going to a serious tournament with a nonstandard set. Sometimes when two players show up for their contest, one player has a standard tournament set, and the other does not. 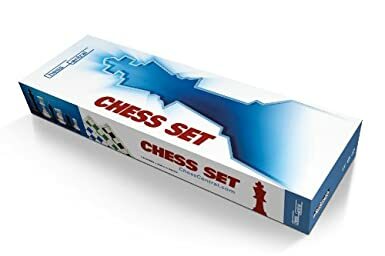 Tournament rules dictate that the player with the standard set can demand the contestants use his personal chess equipment. I have seen this occur on many occasions, and it’s a completely reasonable request. Having played chess for over 30 years, I consider playing with my own personal equipment to be a definite advantage. That’s because there’s just something about playing on a set that you’ve already infused with dozens, hundreds, or possibly thousands of hours of your highest and most concentrated thought. Tournament chess is very intense. It’s highly psychological, and the feeling of comfort and familiarity that emanate out of using your own equipment should not be underestimated. In addition, there are times in the past when I did not come prepared with my own equipment, and had some unpleasant experiences as a result. Once I was compelled to play for a $500 prize on a board with funky blue squares. There was something disturbing about those ugly blue squares, and I could not shake a feeling of annoyance that lingered throughout the entire contest. Needless to say, it distracted from my concentration. On another occasion, I had to play a serious game using red pieces. Very unpleasant, and not the kind of experience any serious chessplayer is looking for. In summary, it is very wise to invest a small amount into your own equipment. The manufacturers all bundle their tournament sets with a board. It goes without saying that all their sets meet standard tournament specifications. We have identified 3 different products that represent the vast majority of purchases currently associated with these products. Is it worth getting a Carrying Bag? The shopper’s most fundamental decision is whether they want to add a carrying bag. Two of the standard product offerings include a bag, and the other one does not. To summarize the pricing, you can purchase a set by itself for slightly less than $15.00, or you can bundle a carrying bag into the purchase for another $10.00. We consider a chess bag to be an excellent investment. A dedicated tournament player needs to carry around a lot of stuff (pieces, clock, scorebook, and 2 pens). All these different objects fit snugly into their own compartment within the bag. the bag helps protect the clock, and all bags contain either a compartment for the clock or Velcro straps that strap it firmly in place. In either case, it is securely fastened, and kept from jostling around. Chess clocks are known to break, and the bag represents added insurance for the protection of the clock. 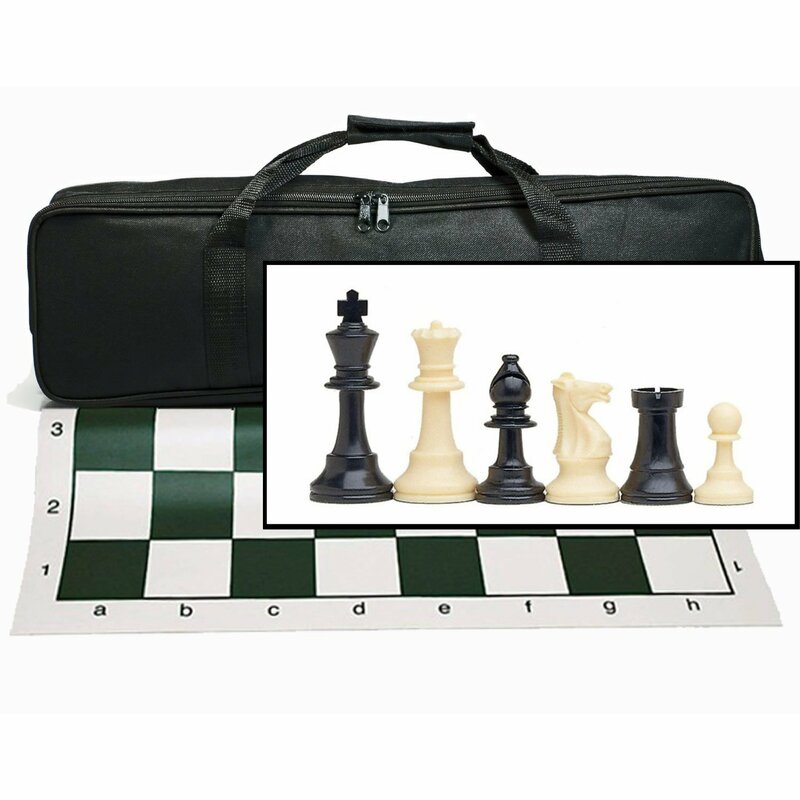 In summary, a chess bag is well worth the extra $10.00, and for those of you who already have sets, it is a highly recommended purchase, although it is slightly more expensive when purchased by itself. Piece Weight is something else to be considered. The pieces and all the sets are constructed out of an attractive, durable plastic, and the manufacturers put lead weights inside each one so they have weight and substance. There is a feeling of satisfaction that’s hard to describe when you move a nicely weighted piece. Square color: This board and set clearly do the job at a great price. I only have one cautionary note: the board comes with either green squares or black squares. Green squares are the standard in tournaments. Not only that, the green squares are much more aesthetically pleasing than the black squares. It’s not easy to say exactly why (softer on the eyes maybe?). What I do know is that I’ve personally spent hundreds of hours gazing into the depths of many different chess boards over the last few decades, and I know what I’m talking about. In summary, make sure you get a board with green squares. On Amazon, over 1/3 gave this product less than 5 stars, which clearly means you could purchase this product, and end up feeling less than fully satisfied. Board quality: There were three complaints about the board, and they all centered around the fact it “creased easily.” This is something worth being aware of, because it’s very important for the board to lie completely flat on the table. Here’s the good news – we have a simple remedy which quickly straightens out a board that has wrinkles or creases. Just put it in your microwave for about 10 seconds. That will completely flatten it out. Piece quality Everyone was happy with the pieces, although one person said he wished they were just a little bit heavier. However, after reading the reviews on Amazon I was left with a lingering question, because two buyers of this product said the weights fell out of the bottom of the piece. So here’s a piece of advice, especially if your set will be used for speed chess. No matter what set you purchase, turn each piece over when the set arrives, and check to make sure the weights aren’t loose. Be prepared with a little superglue (just in case) and your pieces will reward you with thousands of hours of enjoyment. Regarding this specific set, if the weights are not securely glued inside the piece, the triple weighting will create more pressure on the base, and that’s probably why these pieces have experienced some challenges. All in all, and since a little superglue is an easy fix, I very much like the fact they’re triple weighted, and know for a fact that other chess players also greatly enjoy the feel of a heavy piece. I have complete faith a little superglue would do the job, and that means that if I was in the market for a set, bag, and clock this would be my choice. I can mention one web sites that offer good quality and good prices. They are based in Poland (Europe). They ship with FedEx to non European locations and with UPS to European locations.